In an age of 24-hour news, how do we know what’s right? How good is the media? Which branches of it can I trust? Where will I find balance and substance instead of trash and sensationalism? How believable are the anonymous sources on the Internet? How can we trust the media amid the rapid pace of technological change and the apparent erosion of journalistic ethics? How, in other words, do I find truth? These are always important questions, especially since no industry has felt the impact of technological change more significantly than the communications industry. In the early days of journalism, reporters used to write their stories on typewriters. A long, unwieldy editing and production process followed before the final product appeared — a printed newspaper. Today, reporters and photographers produce their work on laptops and transmit them electronically and instantly to their offices. There, it moves from computer to computer, undergoing the editing process, getting headlines and captions written, and flowing into pagination ready for printing with the touch of a computer button. In TV news, too, technology has made for instant coverage of major events around the world, and even in space. Because news is now transmitted instantly, the consequences of getting it wrong are more serious. The responsibility for getting it right is much greater. The war in Vietnam was said to have been the first conflict that brought the horrors of war into people’s living rooms. That was true, but back then several days still elapsed, during which there was time for reflection and editing, before the footage actually appeared on TV screens. By the advent of the first Gulf War, technology had changed all this. Correspondents, using relatively portable transmitting equipment, were able to broadcast from the middle of the desert live, and appear instantly on television screens. Thus we saw a network correspondent reporting that Scud missiles, reportedly carrying chemical agents in their warheads, were incoming. The initial report was false. There were Scud missiles, but not with chemical warheads. By the time the erroneous information was corrected, millions of viewers may have missed it. The roles of reporter and editor are even more critical today in the rush to publish or broadcast without forfeiting integrity. While the media can be a significant force for good, there are also lapses from professional journalistic standards that are disturbing. Any journalism student should have heard of Janet Cooke, the Washington Post reporter who won a Pulitzer Prize in 1981 for her moving story about a child crack dealer. It read beautifully. It seemed well documented. There was just one thing wrong with the story — the child crack dealer she wrote about didn’t exist. You’d think such a scandal would put a serious crimp in journalistic invention but, sadly, such transgressions are still with us. Manipulation of the news is a problem, and an embarrassment to journalists of integrity. Within hours of Osama bin Laden’s death being announced last year, some media organisations ran a picture showing his bloodied, lifeless face with a bullet-hole in the head. The picture was very quickly proven to be a hoax. Who was the source of the image? Was it checked or challenged? Or did media houses, in the rush to beat their competitors, simply accept at face value whatever was thrown at them. Worse yet, was it a news organisation that created the false image in the first place? Take The Mirror’s 2004 account of British soldiers abusing prisoners in Iraq, for example. The abuse apparently did take place but, to illustrate their story, The Mirror staged photos at a Territorial Army base in Lancashire and offered them to readers as the real thing. Rightfully, it cost then-editor Piers Morgan his job. Too often we have tasteless intrusiveness: the cameramen up a tree, shooting through windows families who have pleaded for privacy; the TV reporter who holds a microphone in the face of an 11-year-old AIDS victim and asks how he feels knowing he’s going to die. And don’t even get me started on the scandal of phone-hacking! When it comes to public figures, their private lives are not off-limits to reasonable scrutiny by the media. That’s the price that must be paid by those who seek our votes, demand our trust, and make significant decisions. However, this scrutiny by the media must be reasonable and purposeful, not merely prurient. Around the world, thousands of journalists work honourably at their profession, striving to be fair and responsible, often under deadline stress. But the errors of others are used to impugn them all. The Internet has also contributed to problems. Anybody can get on it, pretend to be a journalist, and publish a scurrilous rumour. 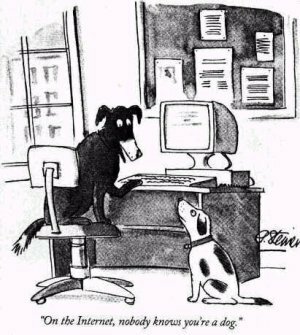 There’s a 1993 New Yorker magazine cartoon I came across recently. It shows a dog tapping away at a computer keyboard and saying to the dog on the floor beside him: “On the Internet, nobody knows you’re a dog.” It’s funny, but it makes a serious point. The Internet is often an anonymous medium. So while we embrace it and recognise the increasingly important role of the “citizen journalist” we still need to test the credibility of those who tell us things on it. Even the best news organisations made mistakes and are often obliged to make retractions. But if we look for the real cause of media transgressions, we see that they were caused by inventing, manipulating, overstating, or misinterpreting the facts. Why? In large part, it is because of the intense competition between media organisations. Hundreds of new cable channels are competing among themselves and challenging the traditional networks. TV news magazines are in fierce combat for audience supremacy. Print newspapers are competing for readers against supermarket tabloids, weeklies, and throwaway freebies. The Internet proliferates. Talk radio jousts with everybody. All journalists should consider journalistic lapses and the effect they have on their credibility as a whole. Standards need to be constantly criticised and reassessed. News organisations need to ensure that mechanisms are in place to permit readers/viewers/listeners to air their complaints, or to rebut perceived misstatements and inaccurate reporting. The role of the Internet as a reliable news source needs to be questioned. If all this adds up to a wake-up call for the media, and leads to better self-policing, that’s good. Journalism today could do with a little more attention to principle, a little more concern about ethics. As a reader, you may be asking, “What can I do about all this?” You are on the receiving end of a torrent of information that will guide many of the decisions you make in life. Therefore, you must make intelligent judgments about what you read, listen to, and watch. You have a responsibility to determine the truth about what is going on around you in your local community, and the nation, and the world. When some elements of the media offer up material you think is inaccurate, distorted, or distasteful, there is an opportunity to be heard. Editors listen. The good ones, at least. They get a daily flood of letters from the public on all kinds of subjects. They don’t always agree, but they pay attention to public reaction to what they published. And when mistakes are made, they generally correct them. So call or write your newspaper or TV/radio station when you think they’ve got it wrong. The saving grace of the media is its incredible diversity — from the sleazy supermarket tabloids to The Times, from TV news magazines to Oprah. The media can often be very good, indeed. It sheds a spotlight on dark corners of our society. It topples public officials found unworthy of our trust. It is the voice and protector of those who would otherwise have no voice. But when it is not so good, it needs individuals like you to help it be better, to hold it to higher standards.